Wearing an Easter outfit devoted to Peeps was pretty sweet! 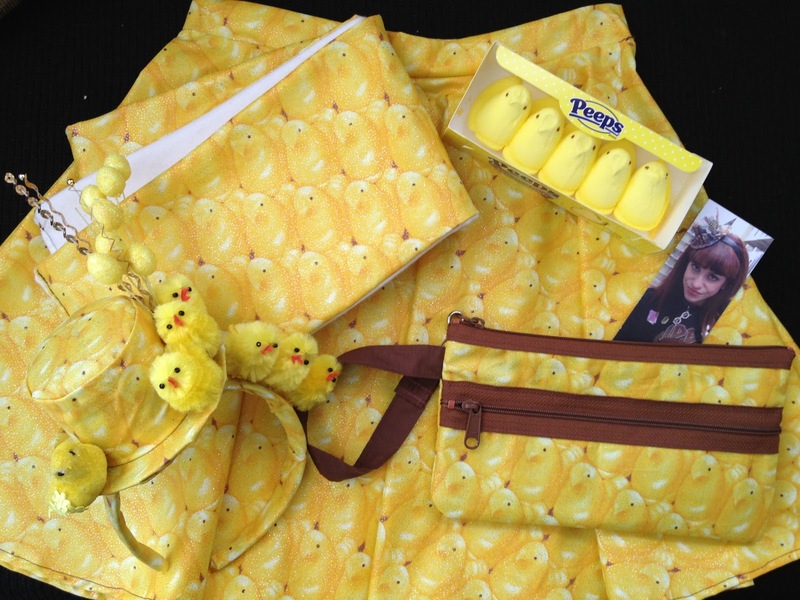 HAPPY EASTER from me and my Peeps!!! For a direct link to the video, click here: "JOYCE Around"
As a redhead with pale skin, I often get mistaken for being Irish. I’m not, but I sure love a lot of things that are. U2. Liam Neeson. Lucky Charms. 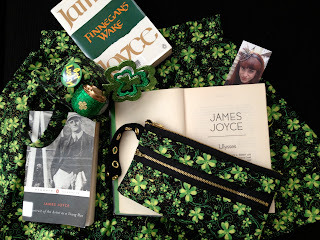 So instead of doing another long-winded blog post about my passion for all things Irish or Irish-inspired (I seriously doubt Lucky Charms are made in Ireland), I decided to put all of those things into a comical song honoring one of our best Irish authors…James Joyce. Joyce is another one of those classic authors that I have a hard time reading. I got Ulysses from the library about two months ago with the intention to get through it by today but I am still on page 35 “I am a struggler now at the end of my days. But I will fight for the right till the end.” I admit to having no idea what this character is fighting for because my creative mind got distracted by a song that kept playing over and over at the Irish pub I was having lunch at. It’s like every Irish pub has a contract with the 90’s Irish rap group House of Pain to play “Jump Around” on the hour every hour for the tourists in the joint. Jeez, how about some Celtic music or at least some bagpipes? Why does everybody have to “Jump up jump up and get down?” Wait a minute. What if I could pass JOYCE around by using an already catchy hook that people will not be able to get out of their heads? Hence how “JOYCE Around” was born. Well, that and I had made another cool hat and needed a place to wear it. Unlike my other parody songs, I rewrote the entire song with my own lyrics honoring several of my favorite Irish actors and musicians. Sadly, I could not include Sinead O’Connor, Jonathan Rhys Meyers, Pierce Brosnan or Cillian Murphy because I couldn’t find words that rhymed! Still trying to finish reading Ulysses on the set. 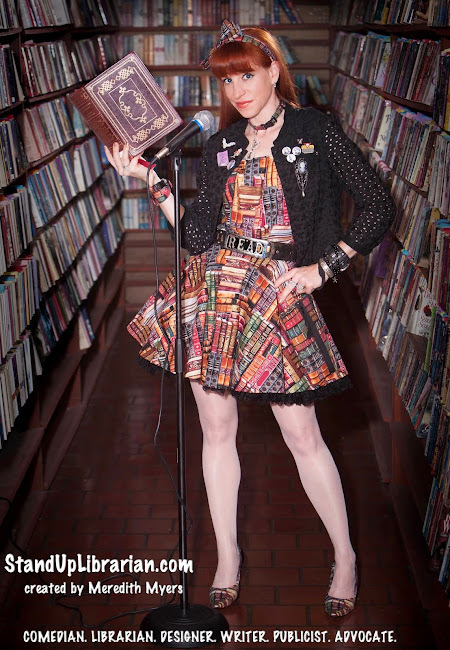 Trying to be tough with my librarian/book tattoos. Once again, I made everything I am wearing in the video. 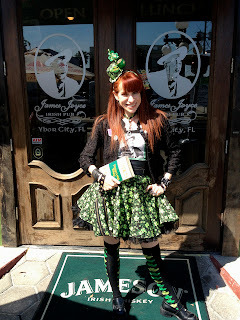 Thanks to the staff at the James Joyce Irish Pub in Ybor! 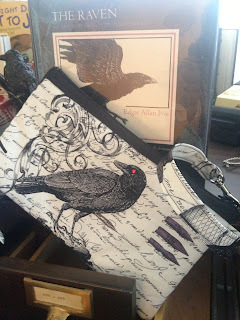 But there was more...my new Edgar Allan Poe/Raven purse! Quoth the Raven, "Buy It!" Since debuting "The Raven is Hard to Handle" last October in honor of Edgar Allan Poe, I have been searching endlessly for the right fabric that speaks to the style and practicality of my purses. Too dark and it would scare people; too white and it would get dirty. I also like to keep my purses reasonably priced so both the employed and unemployed can find items in their price range and so NEVERMORE do we have to look further because my Edgar Allan Poe/Raven purse is available for $30 for a limited time only! 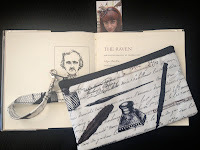 100% cotton in shades of black and white with images of ravens, quills and handwritten script. Each raven is detailed with red Swarovski Crystal eye. Fully-lined with black fabric. ½ inch wrist strap in coordinating fabric with silver hook closure to clip on to belt loops or bigger bags. Inner pocket for storing credit cards, cash and IDs. Dimensions approximately: 4 ½ x 8. 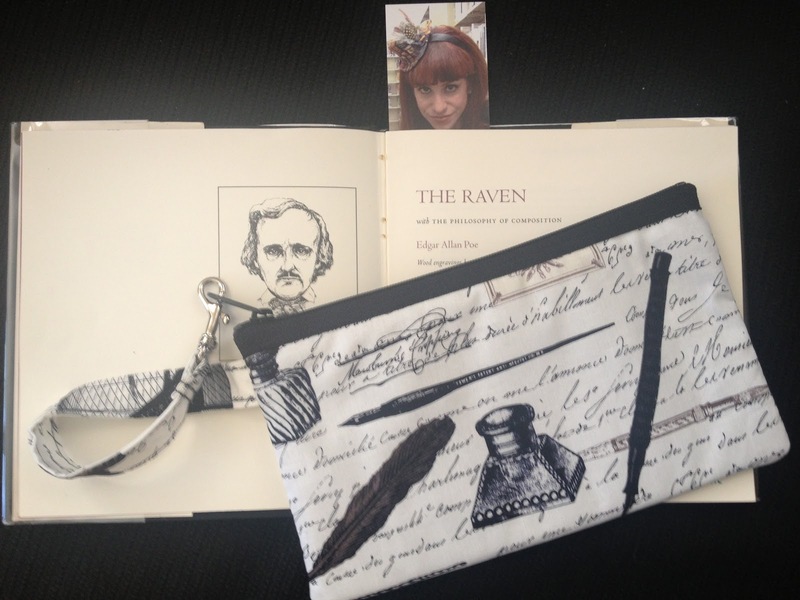 Perfect for any librarian, book lover, poet, and a must have for Poe fans! 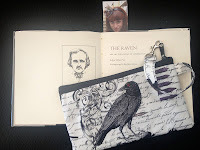 To order your Edgar Allan Poe/Raven purse, please click here. "And the Raven, never flitting, still is sitting, still is sitting"
Back of the Edgar Allan Poe/Raven purse. 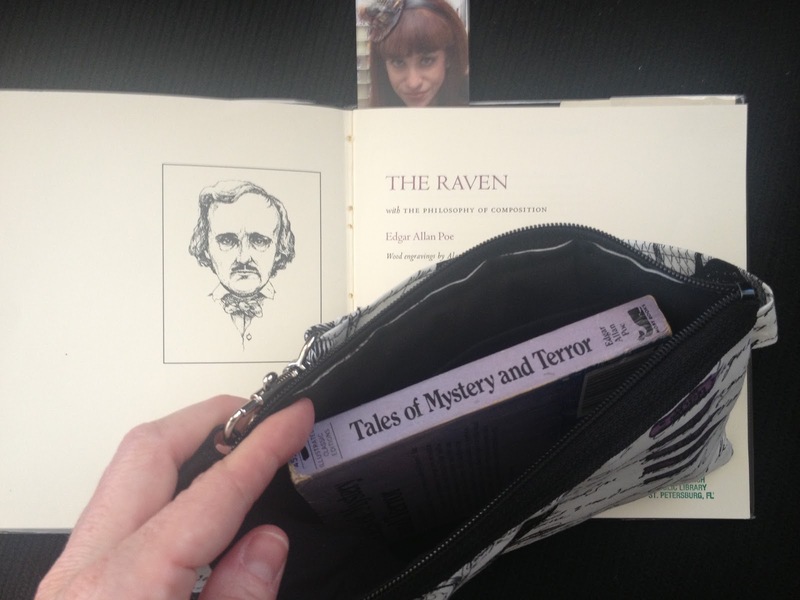 Yes, even a tiny Poe book fits in the purse! 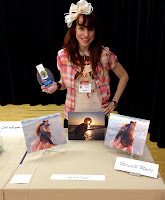 Holding my Blue Shell Award for Photography. Just over a week ago I was proud to be a part of the 66th Annual St. Petersburg Shell Show as an artistic exhibitor. I have grown up collecting seashells so when I moved back to St. Petersburg last year, I joined the St. Pete Shell Club in an effort to join an organization with like-minded individuals who shared my passion. Boy, was I blown away by their knowledge of shelling! Where I always called shells by their common names, these folks referred to them by their scientific names - many of which I couldn't even pronounce! In addition to monthly meetings and the occasional field trip, I learned that the club hosts an annual Shell Show where anybody can submit their work. While I knew that the scientific exhibits were probably out of my skill set, I had been experimenting with broken shells in my purse and headband designs on and off for over five years. It was only after making a mermaid costume for Halloween that I finally figured out how to incorporate the shells into wearable fashion that didn't resemble cheap tourist trinkets. Little did I realize that my fellow shell artists would be even more attention to detail in creating shell art that included dyes and tweezers to assemble the tiniest of shells to frames and knits. It was a lesson that while I have an eye for color and patterns, I still have a long way to go in becoming a shell artist. 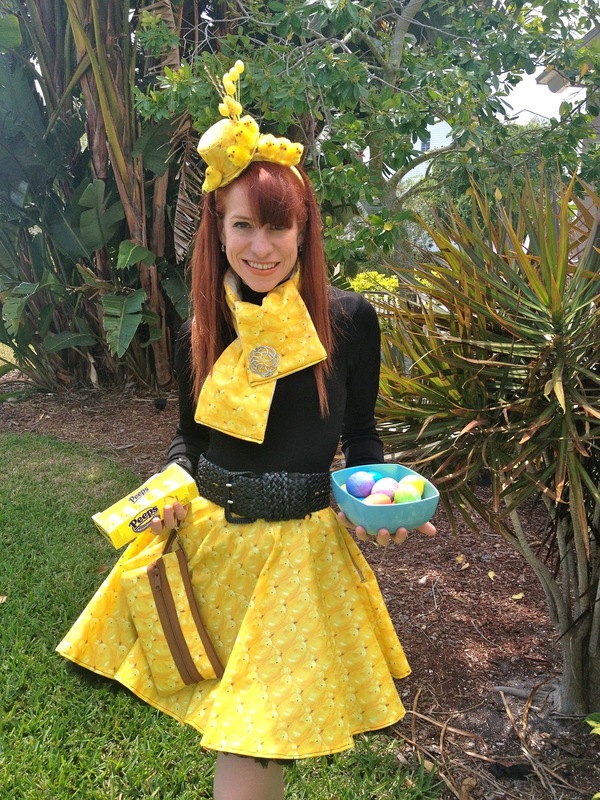 Embracing 3rd place for my Shell Fashions! Another perk of the Shell Show was volunteering in the kids area and teaching them about the various types of seashells found on our Florida beaches. It was finally a place where I felt like the expert...well, until a six year-old walked up and showed me a thing or two! I am constantly amazed by young people and how smart they are. I encouraged the boy to submit an exhibit next year because I think he could win it! 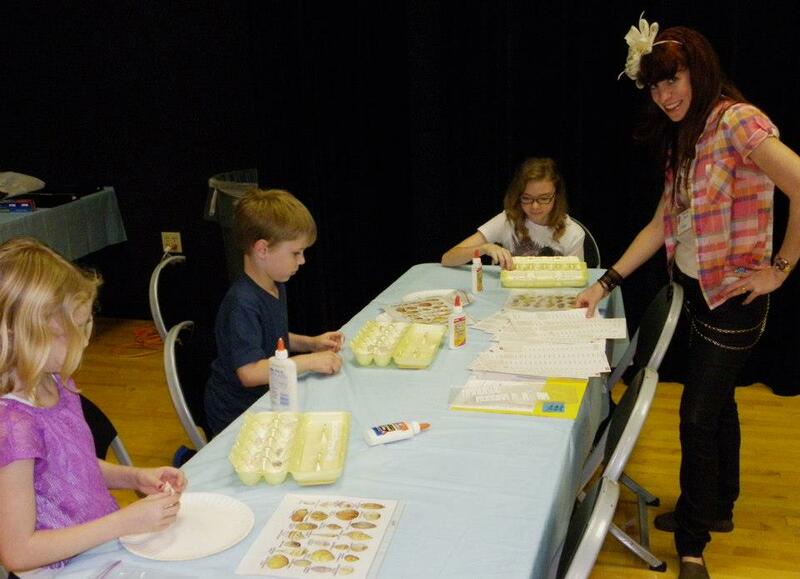 Learning a thing or two about sea shells. Not sure who the teacher is here. The reason I share this experience with you is that I am learning to embrace some of the activities and hobbies that simply make me happy. I love taking beach photographs and collecting seashells. I am sure we have all heard the phrase 'Live your passion' but I don't always think we should make a career or business of it. I have spent years turning things I have enjoyed doing into businesses and careers before actually knowing the work it would entail. I am also learning that it is okay not to be number one. I am a perfectionist by nature so I always strive to do my very best but I have come to learn that there are so many more lessons in coming in second or third, or in not placing at all. Talent is within each of us but it those who continue to compete without the expectation of ribbons or awards who are the true winners. doesn't mean you should be a mermaid. Today I am sick. I woke up with a sore throat, stuffed up nose and my head in a fog. It is only under these conditions that I am forced to stop multi-tasking and just be still. Yet in between sneezes, I try to sew a scarf or write a parody song and yes, apply for a library job because I know that for people like me, there are no days off. I don’t get paid for sick days or vacations so I can’t justify allowing a little thing like a head cold prevent me from producing some kind of result in one of my many projects. So here I am writing on this blog in an effort to be productive while at the same time feeling somewhat weak that I am not strong enough to be doing more. When I am sick, I am at my most vulnerable. I want to quit. I feel guilty, then shame from realizing I have allowed a month to go by without sharing anything on here. Perhaps those words of ‘vulnerability,’ ‘guilt,’ and ‘shame’ are on the tip of my tongue because I was just introduced to Brene Brown and her book Daring Greatly, thanks to a friend I haven’t seen in five years who I ran into at yet another funeral. Great book and I mean no offense to Brown, but I’ve been ‘daring greatly’ my whole life. Putting myself out in the world – flaws and all - has never been a problem for me, I was born courageous. The problem I have is functioning in a world when most people are afraid of your courage as a result of their own insecurities. Try applying for a job working for those people! Impossible. I don’t do what I do because I think I am funny or talented or smart. I do it because I don’t have a choice. I don’t fit in anywhere else. I've tried (and I keep trying) but at the end of the day, I’m certainly not going to let my skills and experiences go to waste. Just last week I went on an interview and two minutes in I knew I wouldn’t get the job. I had overwhelmed people yet again. You think? While most people just work 40-hour weeks, I work all of them – without the use of drugs or alcohol. Even when I sleep, I dream about what I have yet to do and just how I might be able to accomplish it. My creative mind never stops, nor my need to live life to the fullest. I just wish sometimes the voices of doubt in my head would shut the hell up so I can accomplish even more. I also wish I had some help once in awhile.